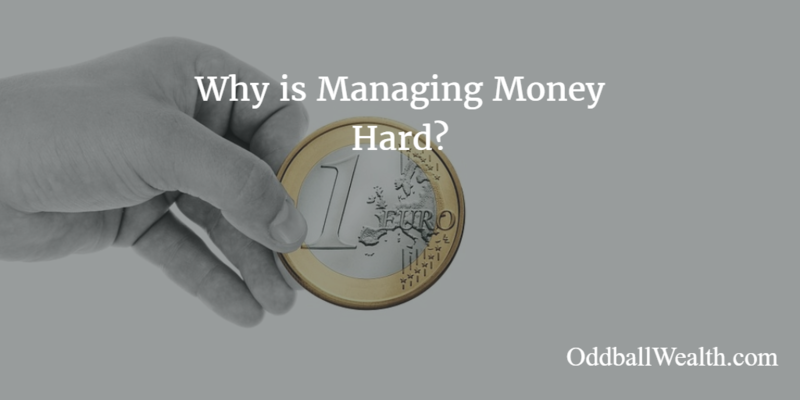 Many people think that managing money is hard. They have many excuses for why they don’t manage their money. A few of them are reasonable excuses but most of them are just a result of laziness. If you’re having a hard time managing all your financial and investment accounts, free finance tools and money management apps like Personal Capital can help you out a lot. Personal Capital is a free budgeting tool and money management service. It lets you manage all of your financial accounts from one place, including your bank, investment, credit card, retirement and other financial accounts. It also shows your net worth and analyzes your investment accounts to make sure you’re not overpaying in fees. The best part is all these services offered by Personal Capital for managing your money are completely free! Now let’s go over some of the reasons and excuses people have for bad money management skills below. “There’s just too much information about managing money and personal finances.” This is a reasonable excuse for not managing your money properly. There is simply so much information available to us today, thanks to the internet, that it makes us indecisive or it immobilizes us. In other words, all the information available to us today can cause information overload. It can be difficult for some people to make financial decisions when there is information pouring out of every ear, telling you what you should and shouldn’t do. As Americans, we like to conduct our own research before making any type of financial decision. Doing your own due diligence before making personal finance and money management decisions is actually really smart. Although, because there is so much information out there available to us, trying to find the correct advice can be time consuming. Reading and reviewing all of the information available can cause you to waste time, become overwhelmed, and immobilize you from taking action. As it says in one of my favorite books called The 4-Hour Workweek, a low-information diet is key for success! Research has shown that the more mutual funds offered in a 401(k) plan there are, the less likely an employee is to pick a fund and participate in the plan altogether. The reason for this is because they have too many options available to them and too many options to choose from. The employees become indecisive because they don’t know what funds to pick and place into their 401(k) account. Now, a 401(k) plan that’s offered to employees with less mutual funds to choose from, are more likely to pick a fund or fund(s) to invest in and participate in the plan. Blame the media for not managing your money. It seems like some of things the media writes and talks about on the topics of personal finance and money makes me want to pull my hair out and run around like an insane person. Okay, maybe I exaggerated that a little, but seriously! It seems like the majority of all personal finance information and financial news out there that’s presented by the media is geared towards old men. Honestly, young people who are only looking for some basic financial advice and budgeting tips end-up getting hammered with information like spending less at Starbucks or strategies about tax-optimization. A word to the media, young people don’t care very much about tax-optimization, it’s too complicating and confusing to them. Also, as far as spending less money at Starbucks goes, you’re wasting your breathe. Young people don’t care how much Starbucks costs, they love it and don’t mind paying extra for their coffee. The only things us young people really care about is where to put our money so it will grow automatically, in accounts with low fees and won’t require a lot of maintenance. Remember the best thing for you and your finances is a low-information diet. This will safeguard you from all the worthless and time-consuming advice the media throws at you. Back in 2007, the financial experts in the media advised everyone to invest in real estate. A year later the real estate market crashed and burned, putting us into one of the worst recessions ever! Now, the same “experts” are advising us on what to do in a post-recession, thanks but no thanks. I’m going to say this in the nicest way I can: Quit whining like a little baby as to why you can’t get your personal finances in order and start taking action! Laziness – agreed! Each week my husband and I save and consistently review how we can make our money work best for us and our children. You are so right. These are small, but practical changes you can make in your life that will make a big difference! Nice work! Thanks for the advice! Thanks Morgan! Very true, small changes and can have big impacts on a persons life! Thanks for sharing these really good tips, I would say nowadays people are facing problems for handling money instead of earning money and articles like yours, simply amazing and helpful. Now people are earning enough money but they are not sure how to handle that earnings. Great tips,Thanks for posting.In my opinion capital management is the best way for managing.After reading above post i applied it.And all my excuses related to poor money management are vanished. Keep sharing such posts please! Thanks Alice, glad you found it helpful! I really love your idea of using a budget calculator to figure out exactly where your finances should be going. It’s so true that everyone should know how to budget their spending depending on their income so that their money is used wisely. I haven’t been the best at making plans for how my money will be spent, but from this article, that is something I would like to get better at. Making wise financial decisions is incredibly important to staying sound money wise. It’s important to do your research and know the trends like you said. Thanks for posting these tips! My dad started his how civil engineering firm while I was growing up. We saw some very lean years while it was getting off the ground. However, once he was more successful, he started to put his money to work for him by investing and other asset management opportunities. Knowing the difference between and asset and a liability can help you use your hard earned money more effectively. Having “money work for you”, instead of “you working for money” is a great feeling! It can also help you reach financial independence at a much quicker pase. Knowing how to invest, understanding asset management, and how to recognize and take advantage of opportunities when presented to you are all very important. Thanks for sharing! Much obliged for sharing these better than average tips, I would state these days individuals are confronting issues for taking care of cash as opposed to procuring cash and articles like yours, basically astonishing and accommodating. dua recently posted…Ask SRJ: What are the Benefits of owning Life Insurance through a Medicine Professional Corporation vs Personally owning it? To make a business success the authority must follow the budgeting strategy. Otherwise, the business will be failed. Very true James. Creating a spending plan and budgeting for expenses is a crucial aspect of running a successful business! A financial manager manages finances and budgets, collects financial data and assesses past performance, anticipates trends and developments, and plans policies accordingly. Financial advisers are really just concern on your retirement plans and how you will have a good retirement. Retirement is a reward for yourself when you get old. And what’s more rewarding is knowing that your hard earned money will be invested good. Thanks for sharing such an important topic here. This is a common problem that every person face in their life.Businesses small and large who neglect to operate efficient financial sectors usually think they are saving money. Retiring is somehow relaxing part of your life. But you need the right managing on your money to be at ease on retiring. Financial fears become excuses after a while! This article is awesome in really saying what is what! Hope to see more of these Tylor.